BERLIN (Reuters) -- Audi outsold premium-car sales leader BMW in April as high demand in China, Germany and the United States boosted vehicle sales. Deliveries of Audi cars and SUVs increased 14.4 percent last month to 125,200, the Volkswagen premium brand said on Wednesday. BMW brand car sales rose 7.4 percent to 121,476 in April while Mercedes-brand sales grew 3.6 percent to 104,344. "Audi will remain the No. 1 challenger to BMW over the next four to five years," said Frank Schwope, an analyst with NordLB in Hanover. "They're firmly rooted in lucrative markets and benefit greatly from VW resources." 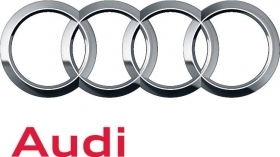 An Audi spokeswoman said the brand's monthly sales last surpassed BMW in January 2011. Audi has narrowed the gap with BMW on year-to-date deliveries, which rose 11.7 percent to 471,300. BMW sales rose 10.1 percent gain to 478,030 while Mercedes brand's volume increased 9.7 percent to 418,246. Audi is vying with Mercedes to seize the sales lead in luxury autos from BMW by the end of the decade. The carmaker has a goal of doubling deliveries to around 2 million by 2020. In China, Audi's No. 1 market, sales rose 44 percent last month to 34,221. Sales in Europe increased 4.9 percent to 66,750, despite the region's economic problems that have depressed consumer confidence. In Germany, Audi's second-biggest single market, sales were up 9.4 percent to 24,301, ahead of the United States, where sales grew 15 percent to 11,521, making the brand's No. 3 market. UK sales rose 5 percent to 8,885, ahead of France, where demand was up 13.7 percent to 5,535. In Russia, sales increased 16.5 percent to 3,287. Audi contributed 44 percent to VW group's first-quarter operating profit of 3.21 billion euros ($4.17 billion).